Hello friends Again we come with new and fantastic Offer of the Year.Wechat Back with Free recharge Offer again worth 1000 Rs Only On Wechat. Here is some easy steps to Get balance. How to earn free recharge from WeRefer WeReward? *You have to complete all 3 activities above to get Rs.5 recharge balance. You will receive an invitation message with your unique link. Share the invitation message with your friends and ask them to register on WeChat by clicking on your unique link and entering all the required details. After a successful registration, get your friends to send you a message/sticker on WeChat to complete the activity. For every friend who successfully registers on WeChat and sends you a message/sticker, you’ll get Rs.25/- free recharge balance. How to send invitation message to your friends? You can send the invitation message with your unique link to all your friends through SMS, WhatsApp, Facebook, Twitter or E-mail. When and how to redeem your FREE recharge balance? A user can redeem his FREE recharge balance only in denominations of Rs. 50. Users can redeem only once in a day. Balance of less than Rs. 50 is not eligible for redemption. To redeem your accumulated recharge balance, go to Recharge>> My Balance. In order to earn recharge, your friend or the user whom you are inviting should be a Non-WeChat user*. 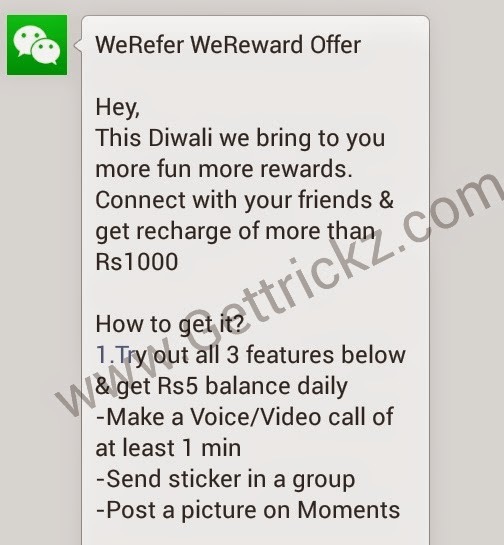 If your friend registers on WeChat by clicking on your unique link, enters all the required details and sends a message to you on WeChat, you will be eligible for the reward of Rs.25/- free recharge per successfully invited user.